Explore a world of snowy trails and serene landscapes on skis. With our free lessons you'll be gliding along trails in tranquil forests in no time. Why learn to cross-country ski with HPSC? Our 22 certified instructors offer cross-country ski lessons on all bus trips between January and March. Lessons are FREE with your membership (vs. approximately $60 for one intro clinic, trail pass, and rentals - no transportation - at a resort). No limits: you can take a lesson every time you come on a day trip. You can also take more advanced lessons, which are generally not available at the resorts. Instructors are all certified by the Canadian Association of Nordic Ski Instructors (CANSI) and participate in professional development opportunities every winter. Lessons are small with individualized attention (generally no more than 6 people in a lesson). It’s social! You meet fellow skiers at your level to ski with in the afternoon, and on future day trips. Beginner: Introduces fundamental techniques to help you get moving on the trails. Bronze: Hones your fundamental skiing techniques to help you move more efficiently. Silver: Introduces more advanced maneuvers and techniques. If you are unsure what level you should be in, don’t worry; the Ski School “Director of the Day” (DOD) will talk to everyone on the bus about the lesson appropriate for their skill level and experience. You can always sign up for lessons on the bus, even if you didn't choose a lesson when you signed up for the trip. Beginners’ day: Held early in the season, there are plenty of instructors on hand to teach new skiers the ropes. 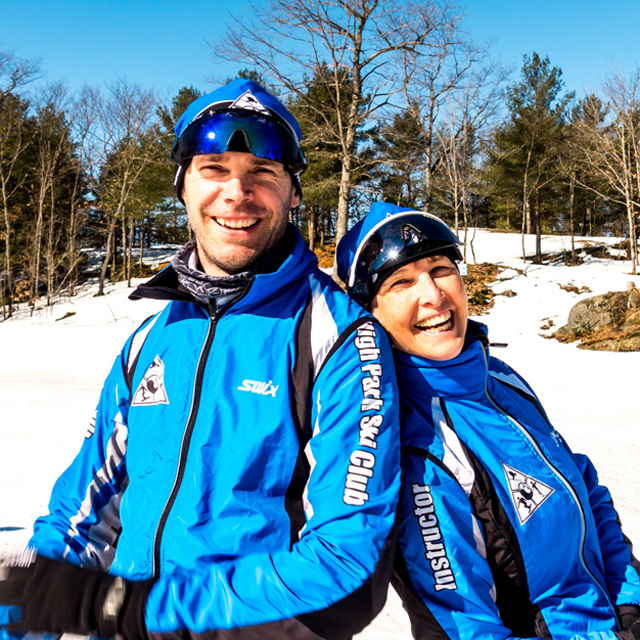 Classic beginners’ series: Held on three consecutive weekends, with the same instructor and fellow skiers, this program will get you moving on the trails and making friends in no time. If you are a member and are interested in this series, please email xcskischool@hpsc.ca. Skate bronze series: Held on three consecutive weekends, with the same instructor and fellow skiers, this program will get you moving more efficiently on your skate skis. Silver skate series: Held on two consecutive weekends, with the same instructor and fellow skiers, this program will hone your fundamental skate skills and introduce you to more advanced techniques. Classic and Skate Silver-Plus Clinics: Level 2 and 3 instructors will be on hand to take your classic and skate skiing to the next level. Tips & tricks: 15-minute one-on-one mini lessons with an instructor offer the chance to work on a particular skill. Race program: 5 races held over the season are a fun way test out your new ski skills. There are also opportunities to train to become an instructor with the club. Talk to an instructor or email xcskischool@hpsc.ca for more details.